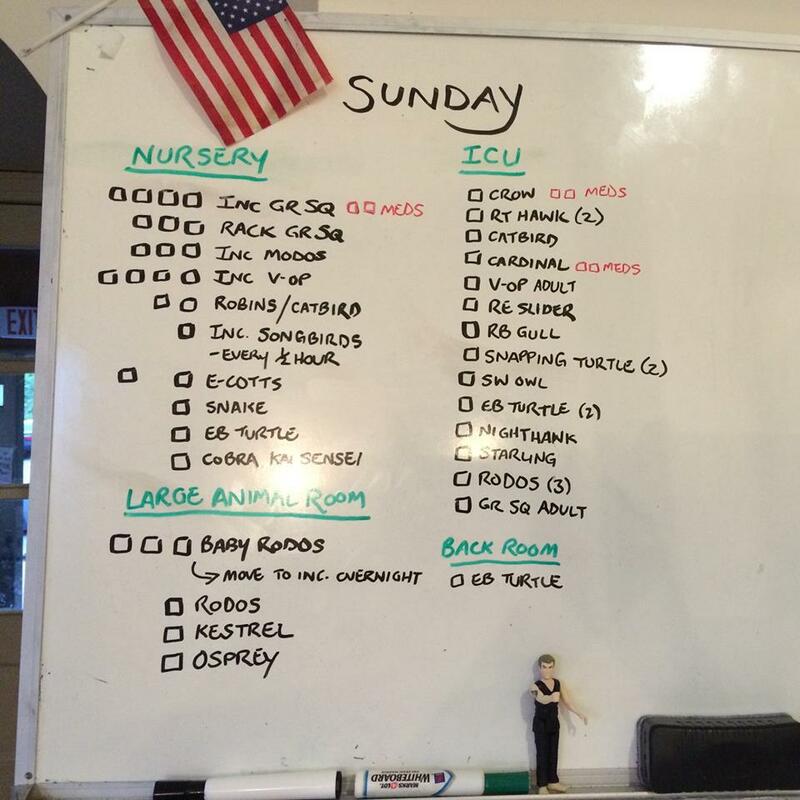 Ever wonder which species are being cared for during a typical day at Philadelphia Metro Wildlife Center? As you can see from the board above, there is quite a variety. Everything from RODOs (Rock Doves aka Pigeons) to GRSQ’s (Eastern grey squirrels) to SW Owls (Northern Saw-whet owl). Every day brings something new through the doors of PMWC! Today’s post is going to focus on a species very near and dear to every rehabber's heart: the V-OP! Aka Virginia Opossum. Understanding the importance of V-OPs to our ecosystem will give you a new appreciation for these fascinating marsupials. Here are some quick facts that everyone should know! They are highly resistant to rabies! This is thought to be due to their low body temperature, which is not conducive to the reproduction of the virus. They eat ticks! Lots of them! Sometimes thousands in a given season! So with the recent rise in Lyme disease in our area, we should all be overjoyed at the sight of these guys in our backyards. They are the ONLY marsupial living in the United States. Their babies are born tiny and pink (about the size of a bee), then journey from the birth canal into her pouch, then nurse and grow for several months within the pouch before leaving and crawling onto their mother's back. They have more teeth than any other North American land mammal- 50 to be exact. This can make them look a bit menacing, but they mostly use those teeth for eating. Their scientific name is Didelphis virginiana, which is just fun to say. Whenever a rehabilitated opossum is released back into the wild, we know we are not only helping that animal and the surrounding ecosystem, but also the surrounding community by helping to consume Lyme disease carrying ticks. Do you want to keep learning about local wildlife? Do you want to see more stories about the work that is done by PMWC? Let us know what YOU would like to see on our blog by e-mailing info@phillywildlife.org. At Philadelphia Metro Wildlife Center, our mission is to provide support and rehabilitation to injured and orphaned wildlife, and to inspire and educate people to care about and coexist with wildlife. We accomplish this work with the support of our dedicated volunteers and are purely funded through donations. Please help us accomplish our mission by sharing this blog post, following our stories, and providing donations of supplies or funding. Donations can be made by clicking here! Newer PostDoves- Two for Two! Older PostA Dramatic Rescue with a Happy Ending!